I have written before that I find it surprising that so few books have come out on Mahendra Singh Dhoni and, although I am an unashamed fan of the Indian cricket captain, I am delighted to see Shantanu Guha Ray's well-researched book appear recently. 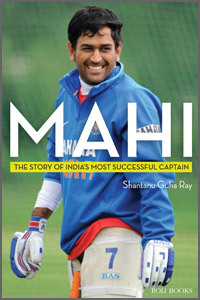 Whereas other books have concentrated on Dhoni's many worthy and extraordinary cricketing feats, this book is more of a behind the scenes story of Dhoni's remarkable career and the author has interviewed a wide selection of people including friends and family to show Dhoni's remarkable journey from humble beginnings to megastar of Indian cricket. It is odd to think that, with Ranchi boasting few cricketing successes when Dhoni was a teenager and that his passion was very much football, he should become in a comparatively short time, the star of Indian cricket. Starting off as a goalkeeper, a coach at his Ranchi school managed to persuade him to take up cricket instead despite the teenager's concerns about the thoughts of his friends. Knowing what he has achieved now, we must give special thanks to this coach. The words cool and Dhoni now go hand in hand but it is nonetheless remarkable the way in which Dhoni handles himself. Indian cricket has produced many role models as cricketers and men and Dhoni is the latest in this long line. Having been asked to make a speech for Dhoni in 2005-06, the initial nerves of making my first public - and indeed televised - speech were soon put into perspective at not only the obvious honour but, ever since, Dhoni has been the most pleasant and well-mannered person when I have met up with him at Lord's since. I have always known that he has many duties and responsibilities and that I have been a further drain on his already hectic schedule but, like other people mentioned in the book, he has a way of making people feel good and special about themselves and I am sure that I am just one such person. Indeed, I was staggered when, after losing the first - and 100th Test between India and England at Lord's in 2011 - Test and seen to all his media responsibilities, Dhoni saw me in the Long Room, stopped his security flunkey and had a further chat. He is a most impressive man. Throughout the book, Dhoni comes across as not only an admirable man and exciting cricketer but also a very astute person. He had seen how Indian cricket works - and the book also very well covers the behind the scenes modus operandi of the BCCI - and has learnt how to use it to his and the team's advantage. Dhoni took over the captaincy of the T20 national side before the first ever T20 world tournament and promptly won the tournament with a tense victory over Pakistan and a side not including three top players. His calmness which we have come to associate with him was already evident. At that stage, India did not embrace T20 cricket and who knows what effect he had on the game in India? Much is made of the closeness he has to the BCCI President, N.Srinivasan, and how this has benefited Dhoni but I would be surprised if others are not equally impressed by him. He has shown that he is not frightened to take difficult decisions for the good of the Indian side and, whilst claims have been made that he prefers the shorter format, he is now 32 and knows exactly how to play every single format of the game extraordinarily well as captain, batsman and wicketkeeper. Some of the on-field decisions he makes may raise eyebrows but I have now realised that he is in a better position to know what he is doing than armchair spectators and to trust and enjoy them. At the time that the book finishes, Dhoni's fortunes, with two whitewashes against England and Australia, had affected his standing as a cricketer and, in a way, it is a sad way to end the book. Since then, however, the Champions Trophy has been won in England and, for once, Dhoni's emotions did come out. His form has since returned and, whilst he is currently the highest paid cricketer, he must also be the most overworked cricketer and surely deserves his achievements. Mr.Ray's book is not only an excellent insight into India's leading cricketing star but should be a welcome addition to the cricketing library on this once in a lifetime cricketer and person.